Thanksgiving is about more than turkeys and pilgrims. This holiday is an opportunity to show gratitude to God for the many blessings given to us. But more the act of giving thanks should not be reserved for this day alone; it is not even limited to Americans. 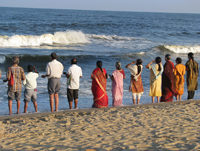 This photograph shows a family in India standing in the ocean praying and giving thanks. Why this place? Why this ritual? Those questions cannot be answered by the image, but there are other lessons to learn from these people. They have come to the edge of the ocean and stepped into the water. They stand in this place where water meets earth and water and earth meet sky, in this place that celebrates the beauty of God’s creation, just as they celebrate something beyond themselves. They have come for a purpose; they are intentional in their praise and prayer. The tide splashes their colorful garb and they are unconcerned. Here, devotion is given precedence over material things. Each person has different gestures, expressing themselves uniquely and yet a part of the group. Savage, McKay. Family Giving Thanks to the Ocean, from Art in the Christian Tradition, a project of the Vanderbilt Divinity Library, Nashville, TN. http://diglib.library.vanderbilt.edu/act-imagelink.pl?RC=54160 [retrieved April 23, 2019]. Original source: http://www.flickr.com/photos/mckaysavage/2279223998/.